Apple, Inc. (AAPL) stock has taken an 18% hit in the past six months on concerns about the impact of America’s ongoing trade war with China and the increasingly saturated global smartphone market. Fortunately, Apple has a seemingly unlimited stockpile of cash that it can deploy in an effort to solve the problems of Apple stock. The owners of Apple stock can expect a large portion of that cash to be returned to their pockets in coming years as Apple pushes its dividend yield up to around 3%. In a nutshell, Apple outlined its own major problem when it lowered its revenue-growth guidance via a letter to shareholders in early January. Apple said that its guidance miss was partially caused by lower-than-expected China revenue in the wake of the trade war. However, Apple also said that its latest iPhones have not generated as much demand as the company had hoped. Apple reported that its iPhone revenue had dropped in its first quarter which ended in December. Unfortunately for Apple and the owners of Apple stock, the growth of iPhone unit sales will inevitably fall over the long-term as markets around the world approach peak-smartphone-penetration rates. After all, the vast majority of Americans already have smartphones at this point. And among those who don’t, how many will get one in the next couple of years? Instead, AAPL needs to focus on the next phase of its growth: monetizing its existing customers by focusing on its Services segment. In the meantime, it can reward shareholders with aggressive capital returns. As of the end of Q1, Apple had $245 billion of cash on hand. AAPL already pays a 1.7% dividend. But Apple has bought back a staggering $208.6 billion of Apple stock over the past five years, really setting it apart from its peers. AAPL has made more than triple the buybacks of any other U.S. company in that stretch. The value of the AAPL stock that Apple has repurchased during that time exceeds the entire market caps of companies like Netflix, Inc. (NFLX) and Walt Disney Co. (DIS). However, following the recent Republican tax cuts, companies that have implemented aggressive buyback programs have been under fire for not investing the money in raising wages and creating jobs instead. In fact, a new bill introduced by Democrats proposes limiting corporate buybacks unless companies first meet a set of predetermined conditions. Democrats may eventually go after dividends as well. For now, their focus seems to be on buybacks. 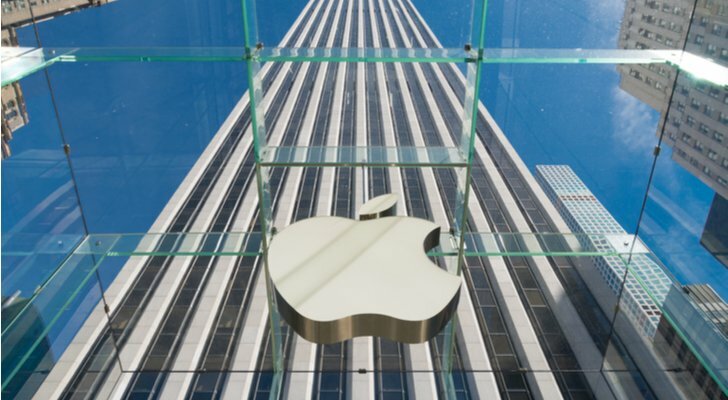 That trend could potentially shift Apple’s focus to raising its dividend. Apple already has a strong track record of growing the dividend of Apple stock. After it began issuing a dividend back in 2012, it has raised its payout each year. Last year, Apple upped its dividend by 16%. However, it can meaningfully increase its current yield of 1.7%. The best metric to assess the safety of a dividend payout is payout ratio. Payout ratio approximates the percentage of a company’s profit that is committed to dividends. The lower the payout ratio, the better. Generally, I like to see companies with payout ratios of under 50%. Companies that devote less than half of their profits to dividends still have plenty of financial wiggle room. Today, Apple’s payout ratio is only 23.1%, so it could double its yield to 3.4% and still keep its payout ratio safely below 50%. And the best part is that it wouldn’t have to spend a single dollar of its $245 billion of cash to raise its dividend to that level. It’s perfectly natural for a maturing company the size of Apple to reach an organic revenue growth plateau. Since Apple seems to be unwilling to invest a large amount of its massive cash stash in a large acquisition, it needs to be much more aggressive with its capital returns. AAPL could easily double the payout of Apple stock to 3.4% or higher without putting any stress on its balance sheet. It would take Apple five years to reach that level if it increases its dividend by 16% annually. However, AAPL could easily be more aggressive and raise its yield to the 2.25% range sometime in the first half of 2019.